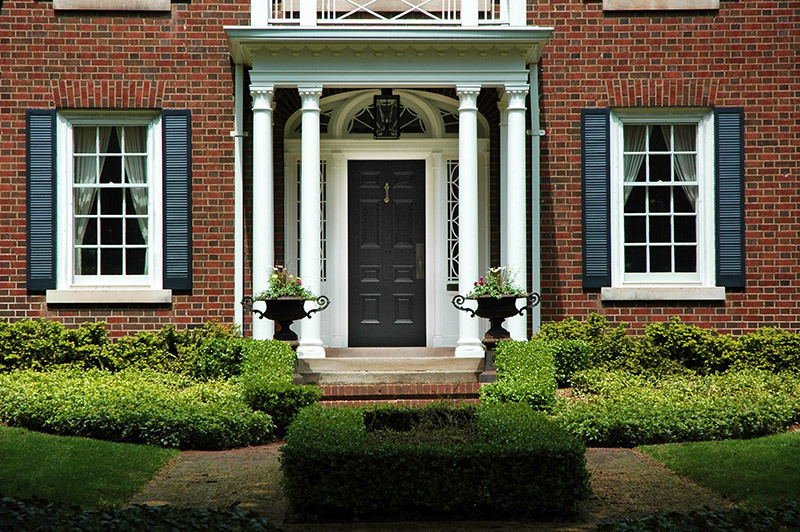 If you’re looking to spice up your front door, look no further than these entry door designs. Remember, the front entry door is the first thing a guest sees when walking up to your home, so you want to make a good impression. The front door is also a great opportunity to express your personal style and the overall aesthetic appeal of your home. There are many different options to look into when choosing an entry door design, so choose what looks best with your home’s style. We’ve put together a list of inspiring entry door designs below! When choosing a design for your entry door, pay attention to the details. You’d be surprised how much of a difference a new door handle or door knocker can make on the overall entry door design. Make a statement by using different metals like brass, gold or silver to give your entry door some contrast. Another way to improve your home’s curb appeal is to add decorations around your entryway. Consider looking into outdoor lamps, benches or planters to make the pathway leading to your entry door stand out. 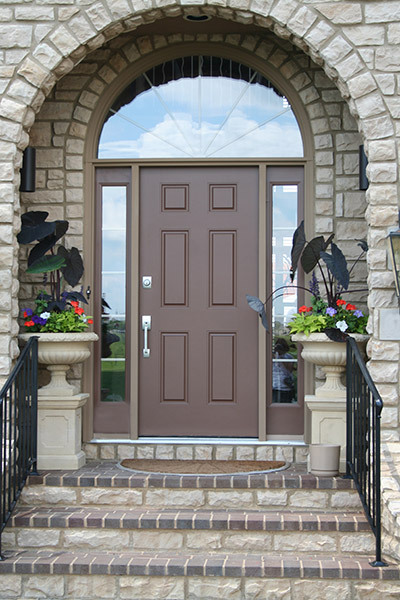 Whether you have a fiberglass, wood or steel entry door, you can add glass inserts to give it some flair. Decorative glass inserts will give your entry door an elegant and stylish look that will be sure to make a statement. Adding glass inserts will give you privacy and allow you to view the outdoors inside. If you’re thinking about adding glass inserts to your entry door, you won’t regret your decision. 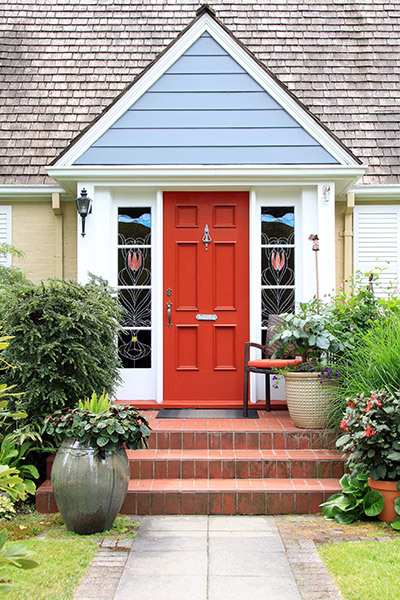 If you are looking to give a “wow” factor to your home, definitely consider adding a pop of color to your entry door. Doing this will add personality and give your home’s look some pizzazz. Whether you are looking to design an entirely new entry door or looking to add some color to an existing one, you’re at the right place. Popular entry door colors include red, blue, green and yellow, but any color that suits your home’s style will look great. Consider adding a small pop of color with door decorations or go all out and paint the entire door. No matter what way you choose, your newly designed entry door will look inviting and improe your home’s curb appeal at the same time! Add eye-catching architecture to your entryway with stunning detail to emphasize the beauty of your home. By doing this, it’ll instantly create a bold look to the entryway. Consider adding columns, archways or other architectural framework around your entryway to accentuate the home’s style. In return, the beautiful, charming design will make your home stand out. Give your home a modern vibe by adding geometric patterns to your entry door. Geometric entry door designs will give a distinct look to your door and make it stand out from the rest in the neighborhood. Geometric patterns can be created on any entry door, no matter what type you already have. Typically, geometric patterns are etched in glass and come in many different designs. 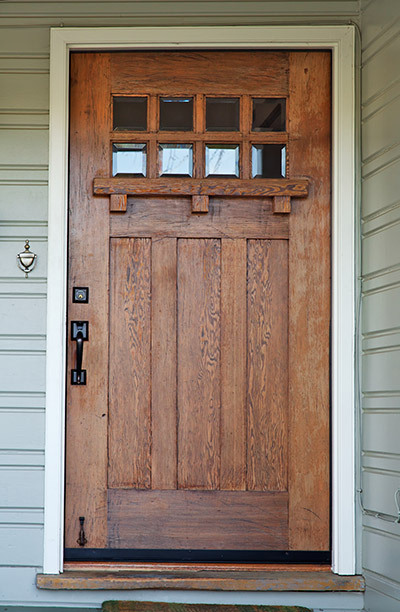 Make your home look warm and inviting by using rustic wood to design your entry door. Wood is a durable material so it is sure to last a long time as well as be extremely practical. Rustic wood creates a unique look to any entry door and comes in a variety of finishes and styles to perfectly suit your home. These doors are typically made from distressed mahogany or knotty alder woods to create that classic, old-time look to the exterior of your home. Consider using rustic wood to design your new entry door as it will instantly create a decorative, welcoming look to your home. You will not be disappointed! A modern front door is very appealing to many homeowners when they want to update their home. Using steel will instantly create a more contemporary look to the exterior of your home and comes in many different varieties to suit your home’s style. Consider pairing both glass and steel in your entry door design to allow for more light to shine through. It will create a brighter, more open feel to the room. If you are looking to create a more updated, contemporary look to the exterior of your home, go with a steel entry door. It will look crisp, sleek and give that modern effect everyone loves! Another way to give your entry door creative and unique design is by adding accents around your door. Creating a symmetrical look around your entry door will give it a more polished look and instantly create unique curb appeal. Look into framing your front door with a pair of potted planters or lanterns. It’ll give an elegant touch to your entryway and bring out your entry door’s design beautifully. Make your home look even more personalized with custom features on your entry door. This will make your home stand out in your neighborhood and grab everyone’s attention immediately. Consider adding custom features such as a curved design, raised panels, etched glass or custom made hardware to your entry door to make a stylish statement. The entryway is the focal point of the home and the first thing everyone sees. Don’t you want it to look appealing? Add these simple architectural features to make it stand out instantly. Give the illusion of a larger home by adding stone or wood columns, curved archways, or glass to your entry door to give it a luxurious appearance. It will make your entryway look modernized and make a beautiful statement. Inspired yet? Hopefully you have come up with a great idea for your entry door by now. If you incorporate any of these entry door designs, your entry door will be sure to look beautiful and unique. There are countless ways to design your entry door, so choose what looks best with your home’s style and go from there!